A tragedy almost equal to the Titanic's unfolded in the fog-shrouded St. Lawrence River in the spring of 1914, only a few months before the outbreak of the Great War. Ironically, had both ships involved exercised less caution, the accident would likely not have happened. The culprit was fog, but a fog peculiar to the St. Lawrence at this time of year, when the warm air of late spring encounters a river chilled by icy meltwater. The two main actors in the drama were the Canadian Pacific steamship Empress of Ireland, outbound from Quebec, and the Norwegian collier Storstad, steaming upriver and loaded to the waterline. Their stage was a stretch of water just east of Rimouski near the St. Lawrence's south shore, where the river opens up and navigation becomes simple and safer. The Empress, having just dropped her pilot at Father Point, was still quite close to shore. The Storstad, about to pick up her pilot for the voyage up river to Montreal, was hugging the coastline. The ships sighted each other near 2:00 a.m. on May 29, until then a calm, clear night. On the bridge of the Empress of Ireland, Captain Henry Kendall guessed that the approaching ship was roughly eight miles away, giving him ample time to cross her bow before he set his course for more open water. When he judged he was safely beyond the collier's path, he did so. If he held his new course, the two ships should pass starboard side to starboard side, comfortably apart. Movements after he had executed this maneuver, a creeping bank of fog swallowed the Norwegian ship, then the Empress. Although nothing like the Titanic in terms of size and elegance, the Empress of Ireland was the class of the Liverpool-Quebec City run that linked Canadian Pacific's steamships with its transcontinental railroad. Celebrities on board were few, notably the actor Laurence Irving, famous son of the legendary Henry, and his wife, the actress Mabel Hackney, returning from a successful Canadian tour. They and most of the other passengers, which included roughly 170 members of the Salvation Army heading to a big convention in London, were by this time of night sound asleep. So were most of the crew. Worried by the fog and the proximity of the other ship, Captain Kendall gave three blasts on his whistle, indicating to the other ship that he was ordering his engines full astern. Soon the 14,191 ton liner had slowed to a crawl, but Kendall kept her bow pointing on the course he had chosen and waited for a clear sign that the other ship was safely past. The next thing he saw were two masthead lights materializing out of the murk to starboard and heading straight at him. The two ships were already too close to avoid a collision, but Kendall ordered a sharp turn to starboard in a vain attempt to swing his stern enough away from the approaching vessel that it would deliver a glancing blow. The impact when it came was deceptively gentle. The Storstad's bow, however, "had gone between the liner's steel ribs as smoothly as an assassin's knife," wrote James Croall in his account of the disaster. And the wound was fatal. Water poured into the starboard side of the ship so fast that most of the people sleeping in starboard cabins didn't have a chance. There was no time for the prerogatives of class to be tested, beyond the simple reality that residents of the higher-up first-class cabins were more likely to have some chance of survival. As the Empress of Ireland listed sharply to starboard, water began rushing into portholes left open despite the rule requiring their closure once a voyage was under way. The list quickly became so extreme that only five or six boats could be successfully launched. After 10 minutes, the liner lurched and lay on her side with hundreds of passengers perched on her hull, a situation that momentarily seemed "like sitting on a beach watching the tide come in," according to one survivor. A mere 14 minutes after the collision, she sank. And by the time the last nearly frozen survivor had been fished from the water, the death toll was staggering. Of the 1,477 on board, 1,012 lost their lives, including 840 passengers, eight more than had died when the Titanic sank. What had happened? According to the first mate of the Storstad, who didn't rouse his sleeping captain until after all the crucial decisions had been made, he and his colleagues on the bridge had distinctly seen the Empress of Ireland's red navigational light just before the fog closed in. If that were true, that red light meant her portside was showing, which signaled that the big ship had turned to pass them to portside. And this is what the men on the Storstad's bridge assumed. After a few minutes groping blindly forward, the Storstad's mate grew nervous and ordered the collier to turn to starboard, away from what he now presumed to be the other ship's course. In reality he was turning the Storstad into the Empress's side. Captain Kendall, who had been thrown off his bridge when the ship lurched onto its beam ends, swore to his dying day that he had altered course cleanly and maintained it faithfully as the fog closed in. He always blamed Norwegian negligence for the disaster. "You have sunk my ship!" were practically the first words he uttered when he was pulled on board the Storstad to encounter her skipper. But perhaps his helmsman had swung her too far before she settled in on her proper course. Perhaps, as one of his crew later testified, there was a problem with the steering that caused his ship to wobble unpredictably on her course. Or perhaps the many lights of the brightly lit passenger vessel confused those on board the Storstad. No one will ever know for sure. For certain, fog had once again proved to be a treacherous enemy. Yet had the two ships simply kept their courses and held their speeds, they would have passed each other without incident. Coming as it did so soon after the sinking of the Titanic, the loss of the Empress of Ireland underlined the difficulty of building a ship that couldn't sink, even of building a ship guaranteed to sink so slowly that rescue was inevitable. True, the Storstad was the worst imaginable ship that could collide with the liner. Her longitudinal bracing, designed to break through ice, made her a lethal weapon; the fact that she was fully loaded meant she punctured the Empress well below the waterline. (She penetrated the liner to a depth of at least 25 feet and left a gaping a hole at least 14 feet wide.) The Empress sank too fast for her safety features to be fully operational. She had enough lifeboats for all her passengers and crew but could not launch them in time. Many of her watertight doors, operated manually, could not be closed with the ship listing sharply and water rushing in. But despite the scale of the tragedy, it never achieved anything like the Titanic's fame or enduring fascination. The Empress of Ireland was not a particularly famous or fashionable ship, and she sank so soon before the outbreak of the war that attention soon shifted to graver matters. The commission of inquiry, chaired by the same Lord Mersey who presided over the hearings into the sinking of both the Titanic and the Lusitania, was held in Quebec City, far from the international limelight. But the lessons from the Empress of Ireland's demise would have to be relearned barely 40 years later during the sinking of the Andrea Doria, when once again fog proved more than a match for the latest in seagoing technology. that run up to five knots and can limit visibility, this is a dive for experts. Nevertheless, the Empress has been visited hundreds of times since it was "rediscovered" in the mid-1980s. Some divers have treated the wreck with respect and increased our knowledge of her tragedy; others have left a trail of senseless damage. Modern divers follow a highway that was blasted into the heart of the ship in the summer of 1914, mere weeks after the disaster. Canadian Pacific hired a salvage company to retrieve the first-class mail, the purser's safe and $150,000 in silver bullion (more than $2 million today). Descending through the explosion hole down to the first-class baggage and mail room, one will encounter a dangerous tangle of wire and an interior debris field of shattered suitcases and their decaying contents. Although the ship rests on a gravel, sediment-free river bottom, the insides of the Empress of Ireland are half-hidden by the silt steadily deposited by the St. Lawrence River over the years. Because the ship rests at so sharp an angle, the starboard side of every interior room is buried, along with all the items set loose as the ship sank. In the mail room, one diver discovered a whole box of neatly bundled and tied newspapers, the paper still white, the type still readable, dated May 27, 1914, the day before the ship left port. The next time he returned, the silt had shifted, burying the evidence. In the ship's dining saloon, oak chairs and tables appear to float in the silt like flotsam and the remains of light fixtures dangle from the steeply angled ceiling. In the adjoining pantry, most of the first-class china that was still in its racks as late as the early 1980s is now gone, as are most other moveable objects in the accessible regions of the wreck, including the ship's bell, one of its propellers, the main bridge telegraph and the telemeter. 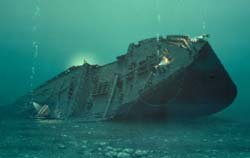 Sadly, some divers have taken the bones of the more than 1,000 people who died when the Empress of Ireland went down. View a comparision chart of the five liners.